Candy Cox is a talented Brazilian Hard Techno Djane, borned in Curitiba, a city in the south of Brasil. Since 2005, her incredible skills on the decks and her beautifull smile has been notice by the world of Techno music. Candy has develloped her own skills and own technics more and more. With a whole lot of personallity and much style, she presents explosive sounds and clever mixings, her sets has always powerfull beats, full of energy, and plus, she can combined all of this talent with the most beautifull smile that the Techno crowd has ever seen. With her sweetness, carism and much love for the music and the crowd, Candy can make the dancefloor go crazy, just by looking at them. Claimed as 'THE HARD TECHNO QUEEN' in some of the countries that she has already been, she can't stop loving her work, putting her heart and soul on it.After almost 4 years of a carreer based on her love for Techno/Hard Techno, a lot of work, research, learning and full dedication, Candy is already recognized as one of the best djanes of the Techno and Hard Techno Scene. 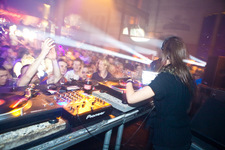 On the last years, she played at renamed clubs, parties and festivals. Candy spreads her love for the music wherever she spins around, with ''some kind of magic'' as some fans says!!! Her presence transmits to the dancefloor, sweetness and such an amazing energy, that make it obvious the reciprocity of all this love with the crowd.Keep your eyes and your ears opened, because our Hard Techno Sweetheart, Candy, is always up to something new and you don't want to miss it at all. gruwelijke set @­ awake fest! en ik sta met dr op de foto op cloudje9 lekker gedraaid daar!! Heerlijk gedraaid op Dance Valley!!! Damn...­ she's great!!! Nice set @­ Cloud9....­ ga ik zeker vaker checken als ze in Nederland is!!! See u on Cloud 9 Groningen !! Triest geval... Heeft de bel horen luiden, maar weet me-god-niet waar de klepel hangt...! Triest geval...­ Heeft de bel horen luiden, maar weet me-god-niet waar de klepel hangt...­! wat een lekker wijf zeg!! i love you're dj set @­ Techno Tv!!!!! See u on Cloud9 Groningen! Geweldig gedraaid @ dance valley ! Heerlijk los gegaan op DV!!! Zeker een lekker wijf! en ook nog verstand van Muziek!